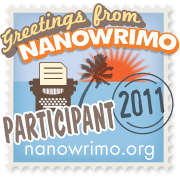 November is NaNoWriMo month. Let the writing begin. Game on! Visit me over there – I am lab5. This entry was posted in inspiration and tagged writing. Bookmark the permalink.